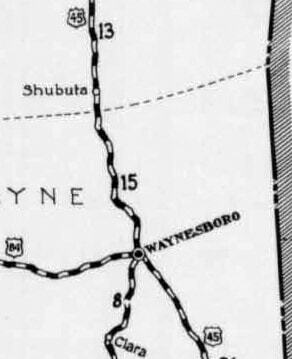 What actually happened on the road was this: until about the mid-1950s, travelers heading east on US 84 were directed south from Waynesboro via US 45. 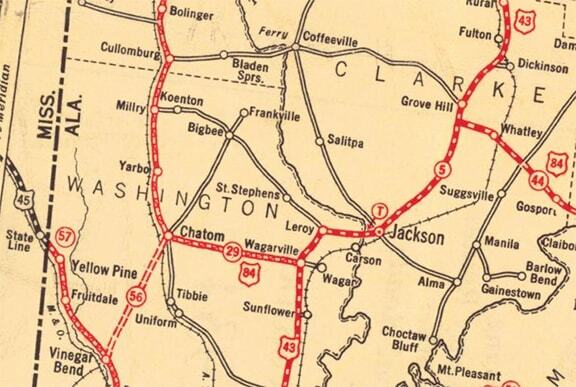 At the town of State Line, US 84 traffic was directed east on AL 56 through Chatom to Wagarville. 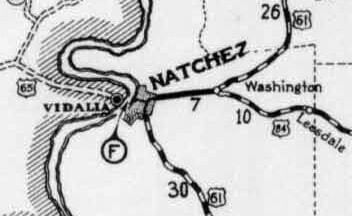 There, drivers were instructed to go north along US 43 to Grove Hill, and then resume eastward from there. 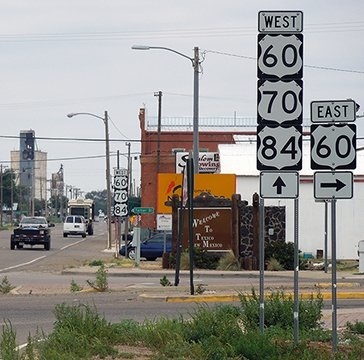 From Cortez, the proposed route of US 84 was south on US 666 to Shiprock; east on US 550 to Aztec; southeast on NM 55 to La Jara; north and east on NM 96 to near Abiquiu; then southeast with US 285 to Santa Fe. 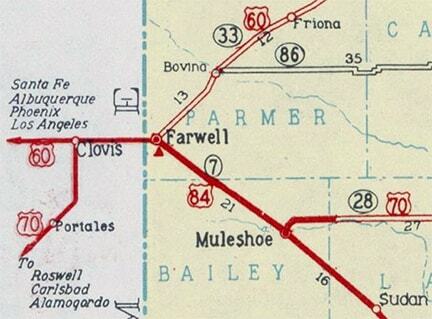 But on that map, only the Colorado segment was labeled as US 84. 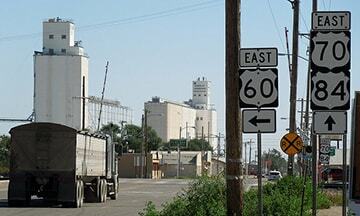 Perhaps it was during this timeframe that NMDoT made the decision to change the way it signed US 84. 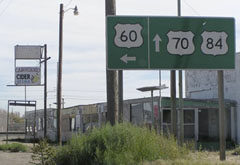 At any rate, today the "west" end of US 84 is technically at Ft. Sumner, because to the north and west from there, NM signs it as a north-south route. 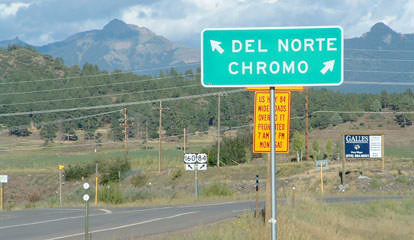 This makes sense north of Santa Fe, but it should have been left east-west between Santa Fe and Ft. Sumner. This would better address the situation west of Las Vegas, where as it stands currently, "northbound" US 84 travels in a decidedly southward direction. 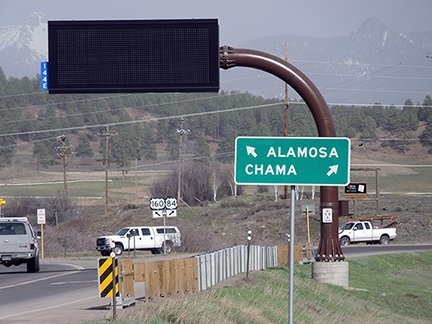 However, there is no risk of confusion due to directional signage, because that segment is overlapped with I-25, and NM does not dual-sign US 84 along there. 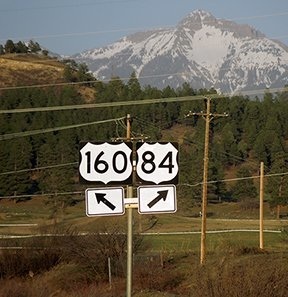 If one takes that right turn, they will not immediately see a US 84 confirming marker. 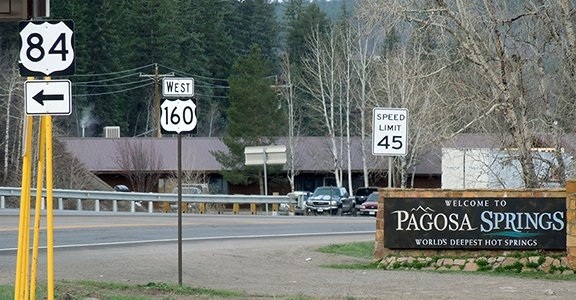 The first southbound trailblazer is essentially right across the road from the last northbound sign, which is about nine miles away from Pagosa. last updated Dec. 6, 2016.